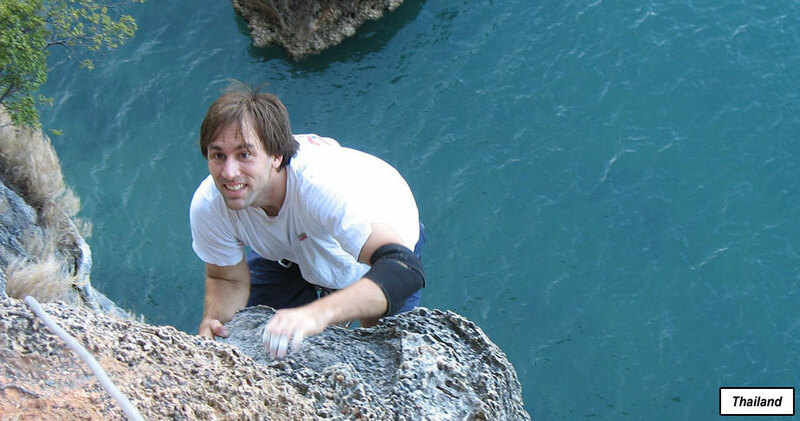 Erik Weihenmayer is one of the most exciting and well-known athletes in the world. Despite losing his vision at the age of 13, Erik has become an accomplished mountain climber, paraglider, and skier, who has never let his blindness interfere with his passion for an exhilarating and fulfilling life. Erik was born in 1968 with a rare eye disease called retinoschisis. The disease rendered him legally blind. It progressed into glaucoma, and by age 13 Erik was totally blind.By the time he got to high school, Erik was completely blind. At first, he had a difficult time admitting his loss of vision, but ultimately he faced it and decided he wouldn’t let it hold him back. The summer after his freshman year, Erik attended wrestling camp. Just as things were starting to fall in to place, Erik was hit with another devastating blow – his mother was killed in an accident. For Erik this was even more horrifying than losing his sight. But, through the strength of his family and their commitment to each other, Erik persevered. He joined the high school wrestling team and became its captain. In 1987 Erik graduated from Weston High School in Connecticut. Erik first tried rock climbing when he was 16, three years after he went blind. Erik’s father, Ed Weihenmayer, encouraged Erik to challenge the ideas of what a blind person can and cannot do. Ed took Erik and his brother hiking often and sent Erik to adventure camps for blind youth where he learned to mountain climb. The seeds were planted early for a life of exploration and adventure. After that, there was no stopping Erik. He graduated from Boston College and went on to receive a master’s degree in Middle School Education. He worked as a middle school teacher and wrestling coach for a couple of years before deciding to dedicate most of his time to outdoor activity. in 1997, he summited Kilimanjaro, the Roof of Africa, where he was married at 13,000’ on the Shira Plateau. Erik and his wife Ellen live outside of Denver, Colorado. They have a daughter, Emma. Erik joined Mark Wellman – the first paraplegic to climb the 3000-foot face of El Capitan, and Hugh Herr – a double-leg-amputee and scientist at Harvard’s prestigious prosthetics Laboratory, to climb an 800-foot rock tower in Moab, Utah. As a result of their successful climb together, the three formed No Barriers, a non-profit organization with a goal of promoting innovative ideas, approaches, and assistive technologies which help people with disabilities. In 1999 Weihenmayer turned back short of Aconcagua’s summit. He cited poor weather conditions and pain in his eyes at high altitude among the reasons. (One characteristic of the most common types of glaucoma is increased pressure in the eyes which ultimately damages the optic nerve.) Later Weihenmayer had laser surgery treatments for his glaucoma prior to the climb. “It made all the difference. I didn’t feel pain until I hit 19,000’. But when I did, it felt like someone stabbed me in the eye with a fork. Drugs and eye drops made it manageable this time,” Weihenmayer says. For Aconcagua, he and his climbing partner and lead, Chris Morris, braved severe winds, minus 70 degrees below zero weather, and a 4 a.m. departure time, to enjoy 20 minutes at the summit. At one point, Weihenmayer spent nearly three hours climbing an exposed ridge, un-roped to his partner, and unable to hear his lead due to high winds. His only guide was packed snow. He knew if he was walking on rock, rather than snow, he was off the path. “When you go blind, you wonder what you will be capable of. Climbing begins to answer those questions,” Weihenmayer says. On May 25, 2001, Erik Weihenmayer became the only blind man in history to reach the summit of the world’s highest peak – Mount Everest. At the age of 33, on September 25, 2002, he became one of the youngest of the elite “Seven Summiteers” – approximately 100 people who have climbed all seven summits, the highest peaks on each of the seven continents. In July of 2003, as part of the four-person team “No Boundaries,” Erik participated in the 2003 Arctic Team Challenge in Ammassalik, Greenland. The challenge included mountain biking, mountain trekking, climbing, glacier trekking and canoeing. Additionally, he has scaled El Capitan, a 3300-foot overhanging granite monolith in Yosemite; Lhosar, a 3000-foot ice waterfall in the himalayas; and a difficult and rarely climbed rock face on 17,000-foot Mt. Kenya. Weihenmayer enjoys breaking through perceived barriers, believing that these public perceptions are often more limiting than blindness itself. But his message about “daring to fail” and “not letting obstacles stand in the way of the dreams of our lives” resonates with all people, blind and sighted. Erik is an acrobatic skydiver, long distance biker, marathon runner, skier, mountaineer, ice climber, and rock climber.Erik is also a certified sky and scuba diver.In addition to being a world-class athlete, Erik is also the author of the book, Touch the Top of the World, published in ten countries and six languages. Erik’s second book, ‘The Adversity Advantage: Turning Everyday Struggles Into Everyday Greatness’, co-authored with business guru and best selling author, Dr. Paul Stoltz, was released by Simon and Schuster in January, 2007. Through Paul’s science and Erik’s experience, the book shares seven “summits” for harnessing the power of adversity and turning it into the never-ending fuel to growth and innovation. Erik’s award winning film, ‘Farther Than the Eye Can See’, shot in the same stunning quality HDTV format as the ‘Star Wars’ prequels, was ranked in the top twenty adventure films of all time by Men’s Journal. Erik’s speaking career has taken him around the world, from Hong Kong to Switzerland, from Thailand to the 2005 APEC Summit in Chile. He speaks to audiences on harnessing the power of adversity, the importance of a “rope team,” and the daily struggle to pursue your dreams. Clearly, Erik’s accomplishments show that one does not have to have perfect eyesight to have extraordinary vision. This entry was posted in Uncategorized and tagged achievements of blind persons, Aconcagua’s summit, blind, blind athelete, El Capitan, Erik, Erik Weihenmayer, eyesight, first blind man to reach Mount Everest, glaucoma, great blind legends, http://www.touchthetop.com/, Kilimanjaro, Mark Wellman, Mount Everest, No Boundaries, physically challenged athlete, Retinoschisis, rock climbing, Roof of Africa, The Adversity Advantage: Turning Everyday Struggles, total blindness, vision, visually challenged, visually handicapped, ‘Farther Than the Eye Can See’. Bookmark the permalink.